Pre-heat the oven to 180°C (gas mark 6). Line a baking tray with baking paper. 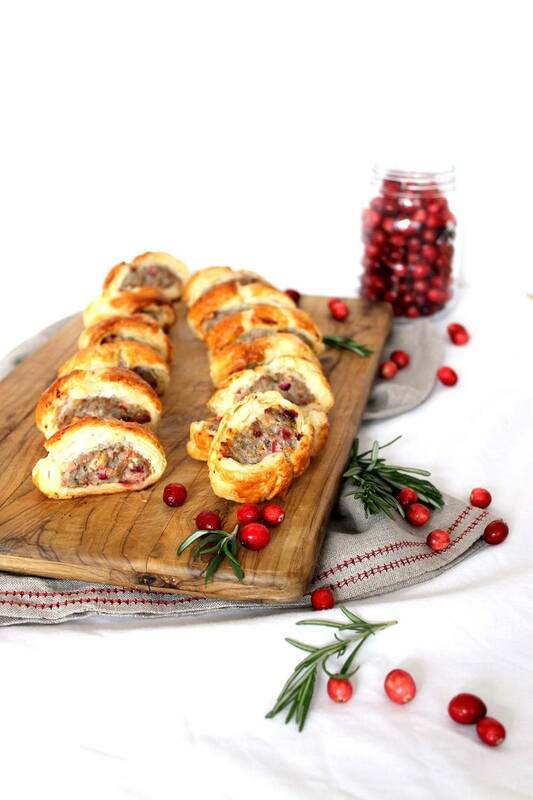 In a large bowl, mix together the sausage meat, cranberries and rosemary. Season with salt and pepper. Place this mix into a pipping bag (or a sandwich bag if you don't have one). Use your piping bag to place a layer of sausage meat down the middle of each pastry rectangle, then brush each with beaten egg on one edge. Fold the other side of the pastry over onto the egg-washed edge. Press down to seal and trim any excess. Cut each pastry roll into 8-10 small sausage rolls. Place the sausage rolls onto the baking tray. Brush the top of each roll with a little more egg and bake for 15-20 min. Serve warm or at room temperature.